The SATS initiative (Small Aircraft Transportation System) is being developed as a result of the AGATE (Advanced General Aviation Transportation Experiments) program by NASA and leading industry companies. NASA has been tasked with overseeing the project and has been providing funds for joint research and development to private companies. This extraordinary program is the first government funding for the light aircraft industry in recent history, maybe even before WWII. The following analysis and conclusions draw heavily upon the recently (July 1999) published NASA AGATE/SATS information and is crucial to understanding the future of light aviation. Many Adobe Acrobat pdf files are presented herein with links for those whose browsers do not support plug-ins. There is a lot of information here, so please be patient. It says it could take 795 seconds to load at 28.8 kbps. You can download the file by following the link above. "Although SATS evolves out of Agate, he said, the four-fold increase in speed does not come from the vehicle so much as it does from smart planning and point-to-point routing. "The follow-on program to that effort, which exploits the positive things done by Agate, is SATS," according to McHugh. "We have at least eight states that are committed to bringing money to the table to do local infrastructure planning within the states." Thus it can be seen that the SATS program is part of the final stages resulting from the implementation of technologies derived from the AGATE program. The entire effort is a joint effort between NASA, FAA, States and US Industry. And finally, the SATS program depends on using technologies derived from the other programs such as NAS Infrastructure, Cockpits, Training, Airframe and Propulsion. The following link will enable you to view the entire SATS Overview as presented by Dr. Bruce J. Holmes in June of 1999. The file is large (almost 2 mb) so you may skip to the conclusions presented below or peruse the original presentation as one wishes. From the presentation entitled State of the Art: Avionics, (to see the entire presentation, Click Here) there is a slide depicting clearly what the SATS aircraft of the "future" would be capable of in terms of performance and range. To see how well the Meyers 200D relates to these stated objectives for the year 2007, one must first go into numerous other SATS documents and other AGATE sources to attempt to define the meaning of the above goals according to the authors. Let's take each goal and attempt to do an analysis and make comparisons. Management is going to state from the outset, that the following will prove that the Meyers 200D is one of the very few, if not the only, SATS qualified aircraft currently available. Currently, there are no FAA crashworthiness standards for aircraft. Aircraft are supposed to fly, not crash. If one builds an aircraft like a tank, it would be too heavy to fly with available engines and would fall completely outside of the program performance/cost guidelines. Therefore, better engineering is the answer or at lease better types of construction. 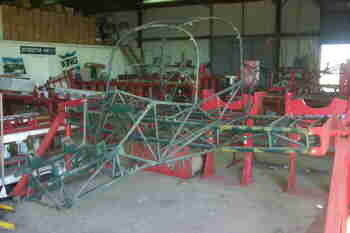 This is a typical chassis showing the tubular steel construction prior to the body panels being placed in position. This construction is absolutely mandatory to protect the drivers at speeds of around 200 mph and is inspected and must pass NASCAR specs prior to being allowed on the racetrack. 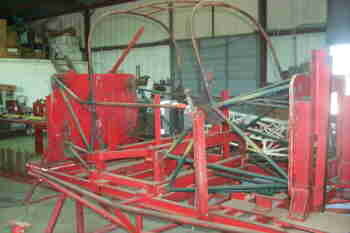 This is a NASCAR frame being assembled in a welding jig to keep the frame true and exactly positioned. Here is the main 4130 chrome-molly steel assembly consisting of the engine mount, center section and cabin section. The pilot and passenger actually sit on the large steel bar running through the cabin, which is the top piece of the main spar. The seat belts are attached to the steel both front and rear and the shoulder harness attach-points are contained in the overhead steel structure which also doubles as the two roll-bars. The center section is about 10 feet wide. There is more steel in the Meyers 200D than in a NASCAR chassis. Here is the Meyers 200D cabin section in its welding jig. 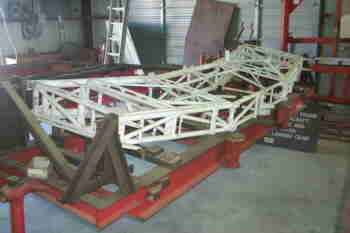 Here is the Meyers 200D center section in its jig. Now, hopefully, your aircraft will never be involved in an off-airport landing. But in the very unlikely event that one is, what type of construction would you prefer to have surrounding you and your passengers? So one can see that steel was proven the best material for automotive construction. In fact, under the picture of the GM concept carbon-graphite car, the caption clearly states that carbon-graphite ("composites" as used by the aircraft industry) is 4 times stiffer than aluminum, only slightly stiffer than steel but costs several times more than aluminum, steel or fiberglass. From the above chart, one can see that in the automotive industry, the cost of making an automobile is $650 with steel, $5,000 with aluminum and $25,000 with composite. Now this is from NASA's AGATE site, it's their own chart. Management is perplexed as to why this fixation on composites remains. Notice, even equally more damaging to the composite theories is their own labor projections. NASA is specifying GA (General Aviation) assembly labor at 500 man hours for aluminum and 1500 man hours for composite. This is a three fold increase in assembly labor alone! And for the total GA labor, NASA states 1200 man hours for aluminum and 2500 man hours for composite. Composites clearly take more man hours to fabricate. And the Lancair Columbia 300 has an airframe life limitation of 1200 hours. (We have recently been informed that this was in the provisional TC and that the real life is 12,000 hours. The 1200 hour data is from the TC and it does not say "Provisional". We'll keep you posted if it is, in fact, upgraded.) For a detailed discussion of the actual physical properties of aluminum versus composites, Click Here. It is the opinion of Meyers Aircraft that aluminum and steel construction is the only current technology available to meet both the safety and affordability goals outlined as well as having numerous other advantages. Another method of reducing costs is to use new design criteria to enable production to move faster. This concept has been applied to automobiles but Management is of the opinion that it will not work applied to aircraft. There is a huge fundamental difference in the design of the two vehicles. An automobile is almost entirely frame dependent. This is to say that the frame can be assembled, components added, engines installed, wiring added and most assemblies finished prior to the outside skin being installed. One can drive an automobile around without any skin and get it to accomplish its intended function (think of a dune buggy). Almost any shape skin can be draped onto a chassis and the automobile will still function. This is exactly the opposite from aircraft. An aircraft is entirely skin dependent. The skin must be built to exact and uncompromising tolerances or the thing will not fly or will fly poorly. An aircraft can be constructed with no insides and with proper ballast added for weight distribution, it can be made to fly (think glider) quite nicely. So with few exceptions, most of the inside assemblies have to be added to an aircraft after the basic skin components are installed or provisions made for securing access panels, cowlings, etc. This is very different from automotive construction. Dr. Roskam states, " I do not believe that there is a significant role for multidisciplinary design optimization tools in the design and development of SATS configurations." Dr. Roskam further states, "For small airplanes I still believe that nothing can beat "horse-sense and experience." A combination of automated aluminum bonding and spot-welding should be considered." Notice Dr. Roskam does not even mention composites. Nor does Dr. Roskam advocate the use of wind tunnels for small aircraft. Business jets, yes, but the sky ("horse-sense and experience") is the best for testing and developing SATS aircraft. Now we are talking about a SATS aircraft that sells for around $84,000! Ability to hangar the aircraft in a standard hangar. The Meyers 200D wingspan is only 30'6", length is 24'4.5" and height is 7'4" at the tail. This allows the Meyers 200D to fit into any standard T hangar. Try to get a Piper Malibu or Mirage into one. The Meyers 200D comes equipped with air conditioning as standard. The system can be run on the ground from a small ground power unit without running the engine for ground pre-cooling. The unit does not have to be turned off for take-off and does not interfere with the aerodynamics of the aircraft. There is a large, retractable assist step with a large assist handle for ease of boarding. The rear seats remove easily for storing large cargo. There is enough headroom for a 6'6" person to wear a hat and not touch the cabin roof. All three wheels use the same size tire so they can be interchanged and rough field operations are very smooth and safe. Engine access for pre-flight is very easy with the newly designed cowling. The interior does not have to be removed for an annual inspection, only the belly panels underneath the aircraft. The aircraft does not have to be kept out of the hot sun for fear of damaging the composite structures. There has never been an in-flight structural failure of a Meyers nor have there been any FAA Airworthiness Directives (ADs) issued against the airframe. How much more reliable can an aircraft get. Good soundproofing and 1/4" plus the optional super-soundproofing package will make the Meyers 200D as quiet as a luxury sedan. So the Meyers 200D does not appear to have an extremely high wing loading when compared to the Columbia 300, Cirrus SR20 or the New Piper Malibu. It is higher than the Mooney's and the Cessna 182. Notice the Interceptor 400 only has a computed wing loading of 25.0, about the same as the Columbia 300 but way below the TBM 700 and the Pilatus PC-12. In fact, a King Air B200 has a wing loading of 41.3, which is higher than all the other examples. So the above illustrates wing loading, but now we have to take the other factor into consideration. At this point, the author would like to state that there must be another factor coming into play. Some other design feature must make an aircraft more or less susceptible to gust induced angle of attack changes. The author has over 600 hours as pilot in command of the Interceptor 400. He also has dozens in King Airs, Mitsubishi MU2s, Malibus, Mooneys, Meyers 200Ds, Bonanzas, Citations, Lears and many other. The I400 at only 25 lb/sqft behaves much better than a King Air B200 but not quite as good as the MU2. The Meyers 200D is way better than a Bonanza or Malibu and probably on a par with the King Air C90 listed at 34.4 lbs/sqft. So what is it that makes the Meyers/Interceptor behave in turbulence like a much higher loaded aircraft? Management believes it must be related to wing twist. Most of the other aircraft do not have such a twist. The Meyers has a NACA 23015 airfoil at the wing root with a +2° angle of incidence. The main spar dihedral is +6°. The airfoil tapers to a NACA 23012 at wing station 62, which is still at a +2° angle of incidence. From there, the airfoil tapers to a NACA 4412 at the tip (station 183) with a 5° washout. This means the angle of incidence goes from a +2° to a -3° angle of incidence at the tip over a 121" length outside of the propeller slip stream. Thus at slow airspeeds (high angle of attack) the outer portions of the wing keep flying as the inboard sections stall, giving positive aileron control way into the stall. I will, however, quote one small section, giving the author and AVweb their due, that being, "... powered aircraft seldom operate like this, and then only near maximum speed since minimum lift is being produced. The wing in this situation actually has a slight angle of attack due to its asymmetrical shape. Zero angle of attack is the angle where there is no final displacement of air up or down. For the classic flat-bottom wing shape, that would be with the trailing edge slightly higher than the forward edge of the bottom. ...Wings move air downward, and react by being pushed upward. That's what makes lift. All the rest is just interesting details." Now, on with the story. So one can see that the outer areas of the wing, in high speed cruise, are actually producing more downward pressure and no lift at all, thereby increasing the real pressure under the areas of the wing that are producing lift. This effectively reduces the wing area and is in disproportion to the actual span due to prop and fuselage effects. Engineering has hypothesized that in the high speed cruise mode, the "real" wing area of the Meyers may be reduced by as much as 40% of actual. If this were the case, the wing loading of the 200D would be about 34.4 lbs/sq ft, which is exactly the same as the King Air C90, which explains how the Meyers 200D behaves like the C90 in turbulence. Without this twist, it would bounce around like the other similar aircraft. The Meyers 200D cruises at or slightly over 200 knots at 75% power. The Continental IO-550 will produce around 225 horsepower at 75% which is obtained (normally aspirated) at between 7 and 8 thousand feet, density altitude. When engines are available that will economically produce more horsepower at this altitude, Meyers Aircraft can install them in the 200D. We know that the airframe has not been pushed into the exponential drag rise area as the Interceptor 400 cruises at 300 knots on 400 hp. Some aircraft will not go appreciable faster with more horsepower as they have entered into this drag rise area. This is not the case with the 200D. In fact, Management has learned that a stock 200D set a World Record in Class C-1.C (2,204 to 3,858 pounds) of 239.5 mph in 1966. This was accomplished by Don Washington flying a standard production model. That turns out to be 208.26 knots! And that was with the IO-520A which is not nearly as powerful as the IO-550G Continental engine! So real world experience with the Interceptor 400 tells us that with the 200D airframe, it takes about 400 hp to get 300 knots of cruise speed. This is perfectly in line with the SATS objectives and will be possible with low-cost piston engines when they are available. The Meyers 200D holds 100 gallons of fuel with the exact useable fuel depending upon the final configuration. The big Continental uses around 15 gallons of fuel per hour when leaned properly, maybe even less with the FADEC system, for an endurance of about six hours counting the unusable fuel. Six hours at an average block speed of 180 kts equals 1080 nautical miles. Pulling back to economy cruise would yield over 1300 nautical miles plus reserves. And adding the Interceptor 400 wings would give 145 gallons of usable fuel for an endurance of 9 hours plus reserves at max cruise for about 1620 nautical miles of range. The Meyers 200D is truly State-of-the-Art! Bottom line: Management does not know of another company with a certified, pressurized, turbo-prop version of their high performance single-engine piston with this type of commonality. Maybe the Cessna P210 came close, but not nearly as close a fit as the Meyers200D/I400 models. Based on the above, it is not hard to see that the Meyers 200D fills the SATS criteria almost exactly and may just be the only fully SATS qualified aircraft available today. AOPA values its relationship with you. If you don’t want this free newsletter, reply with the word UNSUBSCRIBE as the subject. If YOU want to see ePilot with graphics, visit (http://www.aopa.org/members/files/pilot/epilot/). President Clinton’s proposed budget for 2001 includes funding for a demonstration in Virginia of the Small Aircraft Transportation System proposed by NASA. Basically, it is an interstate-like airway system for the masses and would utilize nearly all of the nation’s 5,000 public-use airports. If successful, it could mean boom times for the average community airport, but would not require construction of new control towers or radar facilities. Utilizing mostly turboprop and single-engine aircraft, the system would provide door-to-door air transportation for small businesses and upper-income families. The aircraft would be provided through air taxi, fractional ownership, and private ownership.